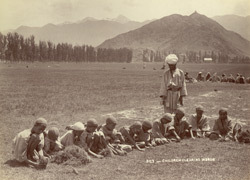 Photograph of a row of children working in a field, probably near Srinagar in the modern-day state of Jammu and Kashmir in India, taken by an unknown photographer in the 1890s. Jammu and Kashmir is a Himalayan region in north-western India famous for its mountain scenery and lakes. Kashmiris work mainly on the land, producing crops and tending animals.